This beautiful beachfront 1 bedroom condo unit is located in the pristine area of South Beach Jaco, just steps from the sand. This boutique luxury condominium features high end construction and finishes, pristine swimming pool and common areas, as well as a manicured beachfront boardwalk area in front of the complex. This condo is sold fully furnished with all high end stainless steel appliances, and beautiful furniture and fixtures. Condo has excellent rental appeal due to its location, new condition and quiet and serene location. This development has just 15 residential condo units located in four separate buildings. 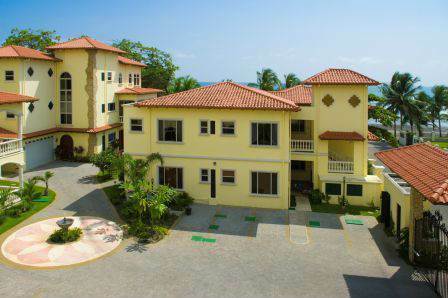 The architecture is based on a modern Spanish Colonial Hacienda painted in beautiful tropical tones. Luxurious finishes include rich custom wood trim of local hardwoods, Italian mosaic tiles in the balconies, entrances, and common areas. Kitchen has granite and marble counter-tops, high end appliances, air conditioning and solid windows with vinyl finishes, all designed for oceanfront living. Showing by appointment only, please call or email to view. HOA is $306 per month, includes 24 hour security, maintenance on all common areas, building insurance, pool areas and water.